Business statistics refers to the science of sound decision-making in the event of uncertainty and is often utilized in various areas and disciplines including auditing, econometrics, financial analysis, production, operations, marketing research and services improvement. Business statistics also feature regular recurring publication of multiple sets of data. Business statistics can also be defined as a branch of applied statistics which works based on collected data. It is capable of providing skills and knowledge that will help anyone in interpreting and using statistical strategies in different business applications. If you are thinking of taking up a business statistics course, then you should keep in mind that it covers a variety of statistical topics including descriptive statistics that usually involve the collection, analysis, description and summarization of data, binomial and normal distributions, probability, confidence intervals, hypothesis tests, correlation and linear regression. A business statistics certification course is beneficial in the sense that it hones your statistical skills and knowledge and these are extremely useful in your attempt to intelligently analyze, collect and interpret data that can help you formulate sound decisions. Learning the most basic business statistical concepts and thinking is also beneficial because of their ability to help you easily solve problems even with the huge diversity of contexts, add substance to all the decisions that you have formulated and dramatically reduce guesswork in the decision-making process. You can also expect knowledge in business statistics to assist you in formulating the soundest business decisions under doubts and uncertainties basing on measurable and numerical scales. 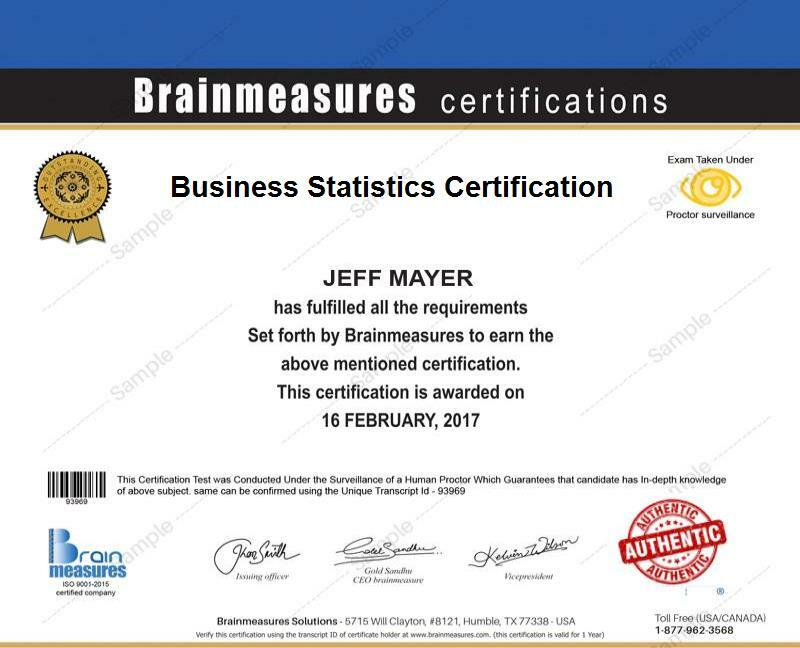 If becoming an expert in business statistics is one of your major goals, then note that Brainmeasures can offer you the best business statistics certification program. Brainmeasures is a reputable online certification company which continuously operates based on stringent ISO standards and has been trusted by many individuals and professionals in the industry. This gives you an assurance that all the topics, information and training that you will get from the business statistics certification program is accurate. This certification course is guaranteed to help you become more familiar about business statistics and how you can effectively apply this in quality control, market research and sales forecasting. The program also lets you become more familiar about the best sources of statistical data that can be used for your business. The comprehensiveness of the program makes it easier for you to pass the business statistics exam which forms part of it and get your business statistics certificate as a reward in passing the test. The business statistics certification program can benefit individuals and professionals who are working in different types of organizations. The certification course targets small business owners, job seekers, entrepreneurs and business professionals who are planning to increase their business statistics awareness while also learning some of the most powerful statistical strategies that are extremely useful in formulating the most effective business decisions. Business statistics certification holders are in great demand at present since all business organizations are in need of experts who can provide them with accurate data useful in decision-making. Because of the great demand for business statistics experts, being certified in this field will let business organizations notice your skills and expertise so receiving a higher pay and a more attractive compensation package will never become impossible. Your annual salary will actually be dependent on the location and the company where you are working. This will also depend on your years of experience and the kind of remuneration or monetary benefits offered by your employer. According to Simplyhired.com, the annual average salary of business statistics certification holders at present is $66,000 with a potential for growth in the coming years.